Surprisingly soft with cardamom, slightly nutmeg and warm apple pie. 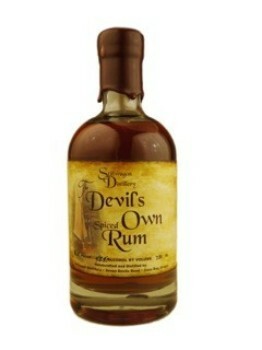 Slightly sweet taste with flavors of sugar syrup, with in the distance hot apple pie, fresh spices and light fruity. Delicious long finish with cane sugar and fresh spices. Put the apple cider, cinnamon sticks, cloves and allspice grains in a pan and bring it to boil. Let it simmer for 10 minutes, then strain the herbs and add the Devil's Own Spiced rum. Finally, divide the mixture over the glasses and garnish with whipped cream and cinnamon.